“Fish” is the theme at Creative Tuesdays. 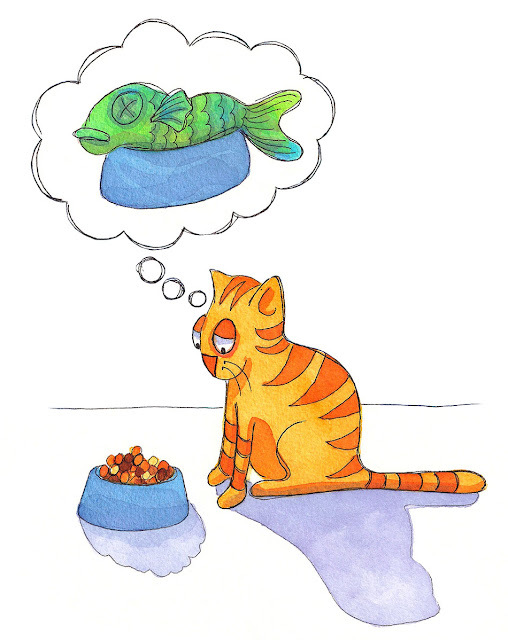 I have a feeling that my cats are ever hopeful that I will one day drop a real fish into the food bowl! Keep dreaming! Be sure to stop by Creative Tuesdays and see other great interpretations of this theme! Thanks to Michael for hosting!! This piece gave me such a chuckle! cute! I like your use of bright colors. This made me laugh out loud too! My cat is always dreaming of food as well but he's too lazy to actually get a fish even if one were near. Love the orange and blue complementary colors popping!